Over 70 students, staff and alumni from Webster Leiden hopped on a double-decker bus to ride to Waalwijk on Aug. 27. With the Gorlok in tow, they headed down to the small Dutch city to attend the 2016 Webster Bowl at Mandemakers Stadium, where the Dutch and Irish national (American) football teams would clash. The contest sponsored by Webster University through the Leiden campus was the first time Ireland had played internationally. 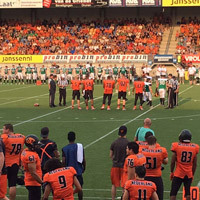 An energetic and orange-clad crowd cheered as the Dutch Lions took the field to a mash-up of electronic music and “The Circle of Life” from The Lion King helped everyone get in the right mood for an exciting evening of American football. Webster Leiden director Jean Paul van Marissing had the honor of kicking the game off with the coin toss. Lightning halted the game early in the third quarter for what became a 30-minute weather delay on a soaked field, but the Gorlok and the Dutch Lions’ mascot, along with the team’s cheerleaders, kept the crowd’s spirits high. See more photos and read more at Webster Leiden. Share via Facebook here.